WATCH: Take a virtual tour of the Ark! 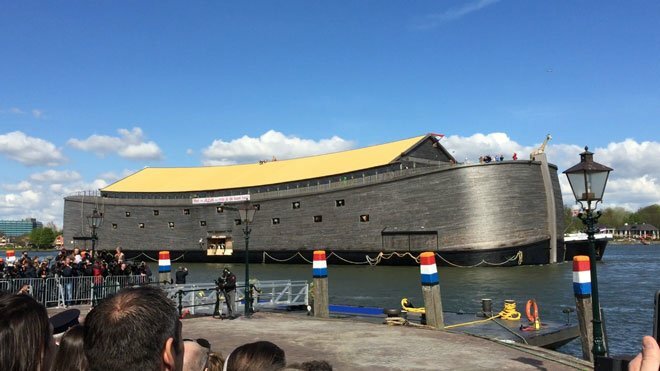 A Dutch Christian businessman who built a life-sized replica of Noah’s Ark has announced he hopes to sail the 95 feet wide, 410 feet long and 75 feet tall vessel to Israel. The Ark of Noah replica was built by Johan Huibers from 2008 – 2013 together with other few amateur carpenters. Since then, the Ark is floating along Holland’s Maas River in the Dutch Bible Belt, a strip of land in the southern Netherlands with a high concentration of conservative orthodox Calvanist Protestants. Dubbed “Johan’s Ark,” it’s been open since then to the public in the Netherlands. It has five decks, is entirely constructed of Swedish pine wood and cost $5 million to construct. The Ark is longer than a football field and can hold more than 5,000 people at one time. In an interview with the Jewish Telegraphic Agency earlier this month, Huibers, who made a fortune building storage spaces, said he wants to take the ark to “God’s land,” as soon as he raises the approximately $1.3 million necessaries for getting there. “This is a copy of God’s ship. It only makes sense to take it to God’s land,” he told JTA. Huibers planned to sail it to Israel straight after its completion, but the plan was postponed “due to the massive wildfires Israel was dealing with at the time,“ according to the Ark of Noah Foundation website. According to the site, the ark was created for Christian educational purposes, focused on spreading the Gospel of Jesus Christ, and social outreach to the underprivileged. Huibers, 60 years old, was always fascinated with navigation. At the age of 24, he straightened his religious feeling, but the decision to build such a vessel came when he was 33 after he dreamt that a fierce storm-tide flooded the entire province of Noord-Holland where he grew up. Huibers has also planned to sail the ark to Brazil, and to several other port cities in South, Middle and North America like Montevideo and Buenos Aires, Havana, Panama, Columbia San Diego, Long Beach, San Francisco, and Seattle.